Paddy John is a product from the FC Twente youth academy. His brothers Collins en Ola are also playing professional football. Paddy moved abroad in July 2011 to sign a 2-year contract at Vfl Osnabrück in Germany. In July 2012 he returned home after a disappointing German season. He signed for AGOVV Apeldoorn on a one season deal until June 2013. 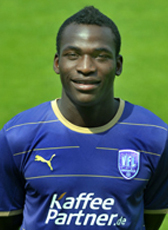 On 11 January 2013, AGOVV was declared bankrupt and John became a free agent. In August 2016 Paddy John signed at GVVV, one of the clubs competing in the new formed 'Tweede Divisie' in The Netherlands which is the third level in de Dutch football pyramid. He left the club during winter-break.